Thanks to your generous support, Spot will be heading off to school to get much-needed training and other care to help him find a loving forever family. For those who haven’t met Spot yet, here’s a little about his story – and how your donations are helping him. 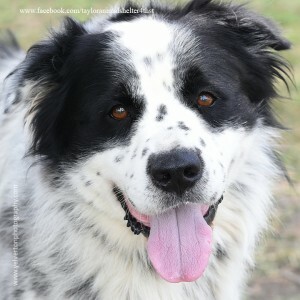 Spot is a beautiful, 8-year old male, Australian Shepherd/Border Collie Mix. He was abandoned by his owner almost a year ago! He has been with the Taylor Animal Shelter since July 6th, 2015. The Taylor animal control officer and shelter manager contacted Spot’s owner who said she had moved from the area and planned on picking him up. Spot’s owner never returned to get him. After many attempts to contact the owner, we realized that he had been abandoned. I think anyone who has ever spent time caring for shelter animals, in any role or capacity, can attest that from time to time you will meet certain ones with whom you feel an extra connection. Spot is one of those dogs for me. Many thanks to the caring hearts who will lead him home! Some dogs develop behavior issues after being in a shelter environment for a long time, and Spot is one of those dogs who has just gotten very stressed out in this environment. Spot is a sweet boy but after having spent so long in a stressful shelter environment after being abandoned by the only owner he has known, he needs some training to help him overcome some behavior issues that he has developed. Even though the shelter staff and volunteers love him very much and have spent as much time with him as possible, the shelter is a very stressful place to be. He needs training to let him know that things CAN be OK again and to help us help him find a REAL forever home. K9 Mastery has agreed to take Spot for extensive training, but he needs $2,500 to attend. Because this is a small, municipal (city run) shelter funded by a very limited small town budget in a tiny, rural town, the funds just aren’t there to help special needs animals. There is something about Spot that speaks to me. He is absolutely adorable. K9 Mastery is an amazing facility with amazing trainers! Thanks to YOUR support, we’ve raised the full amount (and a little extra) to be able to send Spot to K9 Mastery! ♥ The tuition will cover training, boarding, vetting (neuter, shots, well-care) and helping find the perfect forever person for Spot. K9 Mastery is located at 414 Walnut Creek Rd, Bastrop, Texas 78602. If you would like to know more about the Taylor Animal Shelter, please visit them at their Facebook page. Thank you so much for helping us help Spot!